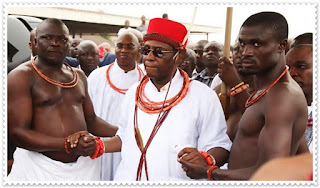 The Edo State Government has withdrawn a letter earlier issued on the Oba of Benin, saying it was issued in error. “The said letter was issued in error as the rites of passage of His Royal Majesty, Omo N’Oba N’Edo Uku Akpolokpolo, Oba of Benin are still on. Mr. Ihonvebere had on Tuesday circulated a letter approving the appointment of Crown Prince Eheneden Erediauwa as the Oba of Benin, with effect from April 29, 2016. The palace of the Oba announced the death of Omo n’Oba n’Edo Uku Akpolokpolo Oba Erediauwa on April 29 even though it is believed by many Nigerians that he passed on long before the formal announcement. Oba Erediauwa, who ascended the throne in 1979, was 92. Almost one year ago, the monarch, , was rumoured to have passed on after an undisclosed illness. Crown Prince Eheneden was formally installed as the Edaiken of Uselu, the heir apparent to the throne on March 7, 2015.